Donalbain: Know how guest feels. Me want to be friends with guest. 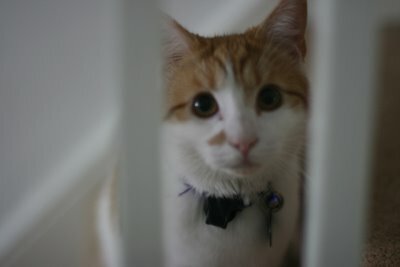 My cat panics and flees whenever anyone enters the house... regardless of whether he knows them. You have let the poor darling out by now, haven't you? Oh, the prisoner, the prisonerrrr...! Woooooooe! My daughter had four cats and a sign posted for all guests: "The cats live here. You don't. Deal." Cute Overload on "Sniper Kitty". Cute! I think if I didn't accommodate my guests' fear of cats, I'd have no right to hope that any hosts might work around my deep fear of dogs. People can't help having phobias, and the way I see it, if you invite someone to your house, you have a responsibility to see that they're comfortable there. I mean, I live there and the guests don't, but I don't see that as giving me the right to scare them. But yes, I only shut her in the kitchen for five or ten minutes. "...the way I see it, if you invite someone to your house, you have a responsibility to see that they're comfortable there. I mean, I live there and the guests don't, but I don't see that as giving me the right to scare them." Wait, you mean you don't invite people over expressly so you can scare them?